Congrats to Dr. Alex Kentsis, St. Baldrick's Arceci Innovation Award Winner! Congrats to Dr. Alex Kentsis, St. Baldrick’s Arceci Innovation Award Winner! Pediatric oncologist and scientist Dr. Alex Kentsis isn’t afraid to dig into what makes childhood cancer tick, especially if his hard work results in better treatments for kids with cancer. That’s why he’s our newest winner of the St. Baldrick’s 2018 Robert J. Arceci Innovation Award — a unique three-year, $250,000 grant that gives researchers the freedom to follow the science, without the restrictions of traditional grants. Read on to learn about the innovative work he’s already doing for kids with cancer and how the Arceci award will move his promising research forward. 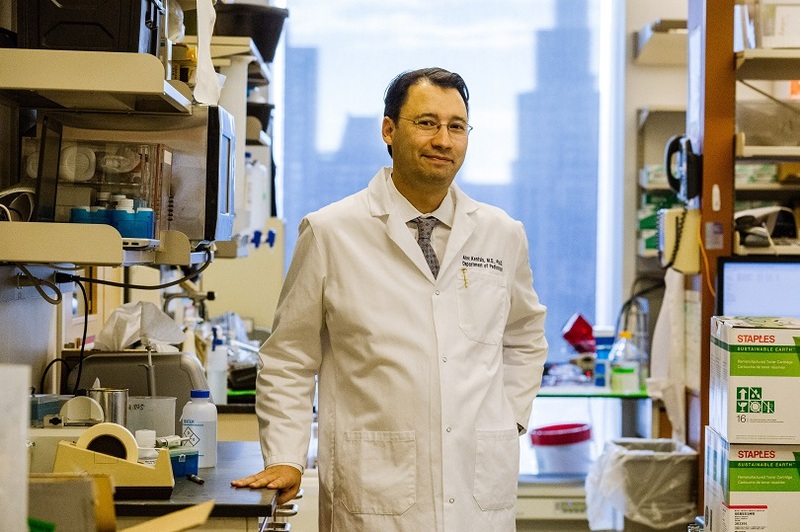 Dr. Alex Kentsis is a pediatric oncologist and scientist at Memorial Sloan Kettering Cancer Center, a father of two and the newest Robert J. Arceci Innovation Award winner. Unlike traditional grants which come with restrictions and are specific and constrained in their scope, this three-year, $250,000 grant allows researchers the freedom and flexibility to follow their passion for kids’ cancer research, their curiosity and the science, wherever it leads. Dr. Kentsis is a big fan of asking, ‘Why?’ – especially when it comes to the fundamental nature of childhood cancer. Unlike adults, kids haven’t had time to damage their DNA. They haven’t aged, smoked or stayed out in the sun too long — so why do they get cancer? This deceivingly simple question is more complex than it seems, and Dr. Kentsis has spent much of his career wrestling with this mystery and others like it. The scientist thinks that the answers to his questions – and better treatments for kids with cancer – lie in a deeper understanding of how the molecules controlling healthy cell development in childhood go awry. 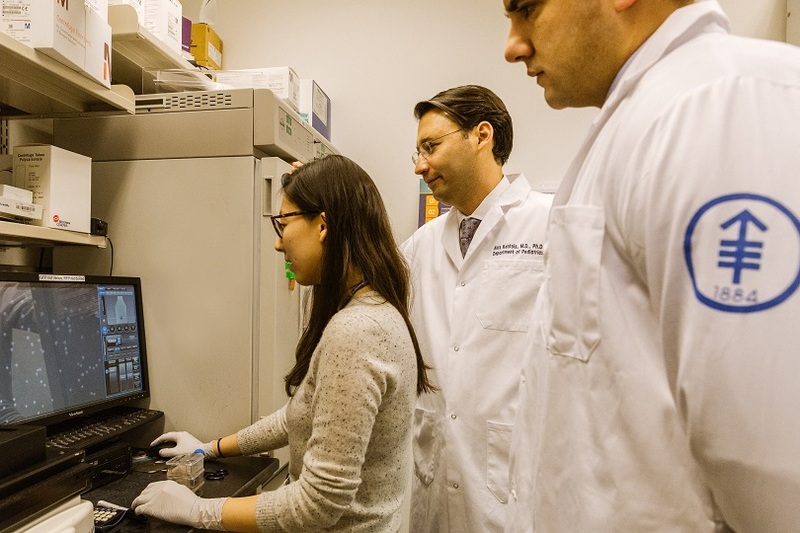 Dr. Kentsis works with the members of his lab in his laboratory at Memorial Sloan Kettering Cancer Center in New York City. Working in his lab at the Memorial Sloan Kettering Cancer Center, he and his colleagues are closely examining both refractory blood cancers and solid tumors in the hope that defining how they are fundamentally caused can lead to better therapies for kids who have few or even no paths to survival currently. For example, Dr. Kentsis and his colleagues recently found that the majority of childhood solid tumors, such as rhabdoid tumors, neuroblastomas, and medulloblastomas, activate a specific molecule called PGBD5, which can move around many pieces of human DNA. The scientists found that abnormal activity of PGBD5 promotes cancer growth, helping to solve the puzzle of why children develop certain cancers and providing new targets and therapies for improved cancer treatments. It’s a puzzle that Dr. Kentsis is eager to keep putting together. And now he’s getting help from St. Baldrick’s, thanks to the Arceci Award – an award that is especially meaningful to him, because it encourages innovation and is true to Dr. Arceci’s focus to “pay attention to important questions as opposed to merely difficult ones,” Dr. Kentsis said. “I hope that further work will continue to advance both our basic scientific knowledge about how young people develop cancer, and to use that knowledge to discover and develop new treatments for children that are precise, curative and safe,” he said. Be a part of the next lifesaving discovery for kids with cancer. Fund research today.